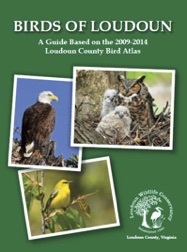 We see them at parks and in our wooded backyards. Just like with the Redskins, people are either fans or enemies or never give them any thought. They bound gracefully across roadways, though unfortunately they don’t always make it across. For some city dwellers, this may be the only wildlife they see on a regular basis. Squirrels are a very important link in our ecosystem. They provide a nutritious meal for hawks, owls, foxes and more. One of their greatest contributions is the planting of about 1,000 acorns per year per squirrel. Each fall they gather acorns, then bury and stash them away, readily available supplies that they can recover in the winter when other food sources are scarce. Many of the acorns that are not eaten turn into tree saplings and may eventually mature, producing more acorns and continuing the oak life cycle. It is reported that squirrels can locate an acorn through up to one foot of snow. They are so sneaky that they sometimes resort to pretending to hide acorns to fool other animals that might be watching. There are 287 species of squirrels in the world, and Gray Squirrels (Sciurus carolinensis) are one of six types found in Virginia. 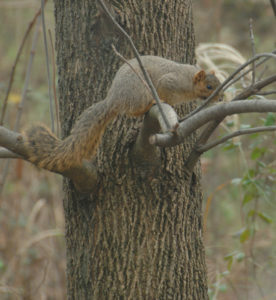 (The others found in Loudoun County are the Eastern Fox Squirrel (Sciurus niger) and the Southern Flying Squirrel (Glaucomys volans)). Gray Squirrels weigh about 1 to 1.5 pounds and grow up to 18 to 20 inches in length. They have two litters of young per year, in the winter and in the spring. They do not hibernate, but during winter’s harshest days will stay curled up in their dens, called dreys or drays. Drays are usually built of twigs, dry leaves and grass, and typically assembled in the forks of a tall tree. They are sometimes referred to as “drey nests” to distinguish them from squirrel “cavity nests”. In temperate regions like ours, dreys become much more visible in the autumn, when leaf-fall reveals new nests built the previous summer or in early fall. Squirrels communicate with vocal calls as well as tail flicks, employed in a variety of combinations to convey alerts about approaching predators. 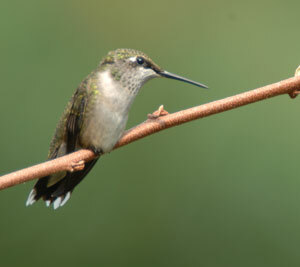 They also flick their tails to indicate that they are irritated. As anyone with a bird feeder knows all too well, they are talented athletes, acrobats and problem solvers. Though countless contraptions have been invented and sold to keep squirrels from raiding our backyard feeders, somehow squirrels manage to get their share. Like many other rodents, squirrels have front teeth that never stop growing. They need to constantly gnaw in order to keep their teeth trimmed—one reason why squirrels do not generally make good pets. In fact, since they sometimes invade our attics and chew on wiring, they are often considered a nuisance. 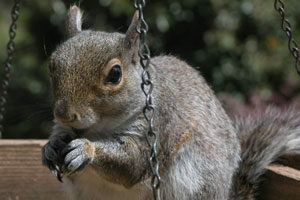 Professional wildlife management resources can provide advice on humane methods to address problems caused by squirrels. As with managing all suburban wildlife, it’s best to employ strategic prevention techniques and address all issues promptly. Several mass immigrations by Gray Squirrels have been documented within the United States. Texas, Pennsylvania and Indiana all saw periods where thousands of hungry squirrels invaded their communities. In each of these instances the influx was preceded by a rich yield year of acorns (known as a mast year) followed by a scarce year, forcing the squirrels to embark on a frantic quest for more food. For some Native American tribes, squirrels represent natural intelligence and the ability to plan ahead. These clever, highly adept acrobats deserve our respect and appreciation for their clever antics and all the fun they bring to our lives.